Originally published in 1986, one of the major developments in behavioural psychotherapy and mental health in the previous decade had been the growing involvement of non-psychologists in behaviour therapy. This was a result of the fact that there were too few psychologists to cope with problem behaviour and that other professionals or carers began to appreciate more clearly their potential as agents of behaviour change. Foremost among these ‘mediators’ of therapy were parents, nurses (particularly psychiatric nurses) and teachers (especially remedial teachers). Their involvement had greatly increased the efficiency of behaviour therapy at the time and opened up a new era in applied psychology. It also entailed the development of new training formats, evaluation procedures and implementation strategies. 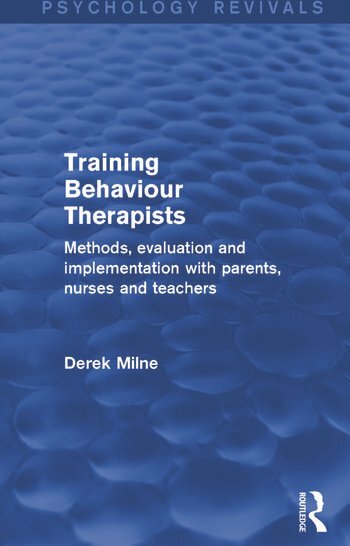 The main aim of this book was to provide a summary of the research relevant to these issues, and to offer practical guidelines to those who were interested in training or being trained as behaviour therapists. For this reason there are chapters by researchers who have been involved in training parents, nurses and teachers. These chapters provide a detailed account of training in a form that was rarely available in published form at the time, and even today should be of great assistance to readers. Foreword by Gail Bernstein. Acknowledgements. Preface. Notes on Contributors. 1. ‘Giving Psychology Away’: An Introduction 2. Placing Behaviour Therapists in Context 3. Parents as Therapists: A Review of Research 4. Bruce L. Baker Parents as Teachers: A Programme of Applied Research 5. Nurses as Therapists: A Review of Research 6. Nurses as Therapists: The ‘Core Course’ Illustration 7. Teachers as Therapists: A Review of Research 8. Peter Farrell Teachers as Therapists: An Account of the EDY Project 9. Summary and Discussion: ‘Giving Psychology Away’ – An Integration. Appendix: Behaviour Therapy Proficiency Scale. References. Index.